In economics, shrinkflation is the process of items shrinking in size or quantity, or even sometimes reformulating or reducing quality while their prices remain the same or increase. The word is a portmanteau of the words shrink and inflation. The term's coined has been attributed to both Pippa Malmgren and Brian Domitrovic. Shrinkflation is a rise in the general price level of goods per unit of weight or volume, brought about by a reduction in the weight or size of the item sold. The price for one piece of the packaged product remains the same or could even be raised. This sometimes does not affect inflation measures such as the consumer price index or Retail Price Index, i.e. might not increase in the cost of a basket of retail goods and services, but many indicators of price levels and thus inflation are linked to units of volume or weight of products, so that shrinkflation also affects the statistically represented inflation figures. A website in Japanese explains how hundreds of well-known products have been reduced in size, how much has been reduced and when they were reduced. In 2009 Mars reduced the size of their Mars bar from 62.5 grams to 58 grams, while the price remained at 37 pence. In 2010 Kraft reduced its 200g Toblerone bar to 170g. Tetley tea bags were sold in boxes of 88 instead of 100. Nestlé reduced its After Eight Mint Chocolate Thins box from 200g to 170g. Cadbury's Crunchie were sold in packs of three instead of four. In 2013 Cereal Partners sold Shredded Wheat Superfruity for £2.68 at Sainsbury's; was put on £2 special offer, before returning to £2.68, but with less cereal in each box. In January 2009 Häagen-Dazs announced that it would be reducing the size of their ice cream cartons in the US from 16 US fl oz (470 ml) to 14 US fl oz (410 ml). In July 2015, a tub of Cadbury Roses which weighed 975g in 2011, was reduced to under 730g, while a tub of Cadbury Heroes was reduced 695g, however the price remained the same at around £9. In 2016, Mondelez International again reduced the size of the UK 170g Toblerone bar to 150g, while the 400g bar was reduced to 360g. This was done by enlarging the gap between the chocolate triangles. In 2017, Milka Alpine Milk and Milka Nuts & Raisins got reduced from 300 g to 270 g while Triolade got reduced from 300 g to 280 g, all without changing the bag size. 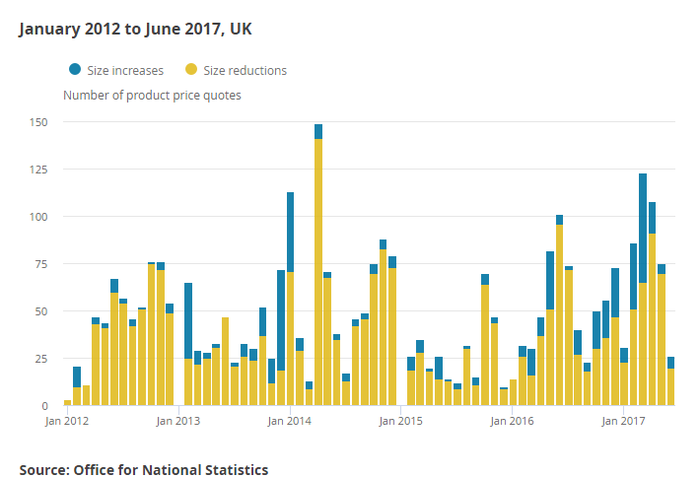 ^ "More than 2,500 products subject to shrinkflation, says ONS". bbc.com. BBC News. Archived from the original on 2017-07-24. ^ "The scourge of Shrinkflation eats away at the man in the street like a cancer!". Perpetual Traveller Overseas. Retrieved 2014-06-08. ^ "That Shrinking Feeling". Merriam Webster dictionary. Retrieved 21 January 2019. ^ "'Why do it unless it is to make more money out of us? ': Products are getting smaller while the price you pay stays the same". Associated Newspapers Limited. Retrieved 18 May 2014. ^ a b "That shrinking feeling - how Golden Wonder made me a victim of shrinkflation". Mail Online. Retrieved 2014-06-09. ^ a b c d "VAT rises but food shrinks". Daily Mirror. Retrieved 2014-06-09. ^ York, Emily Bryson (March 9, 2009). "Ben and Jerry's Calls Out Haagen-Dazs on Shrinkage". adage.com. Advertising Age. Retrieved November 22, 2015. ^ partysugar (March 10, 2009). "Ben and Jerry's vs. Haagen-Dazs: A Pint-Sized Battle". popsugar.com. POPsugar. Retrieved November 22, 2015. ^ a b "Shrinkflation! How big brands have cut the size of products - but not the price of them". Mail Online. Retrieved 2016-06-23. ^ "Cadbury take ELEVEN CHOCS from Heroes and Roses tubs but price stays same". Daily Express. Retrieved 2016-11-27. ^ "Toblerone triangle change upsets fans". BBC. Retrieved 2016-11-08. ^ "Jaffa Cakes packet size reduced in latest 'shrinkflation' move". The Guardian. Retrieved 2017-09-26.